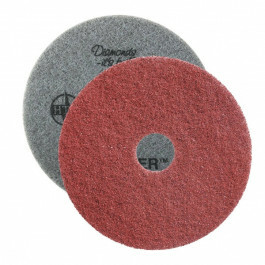 This 400 grit pad should be used on floors that need heavy duty cleaning like worn concrete floors. This Twister pad is made with microscopic diamonds that will remove deep scratches and heavy stains and will produce a nice matte surface. 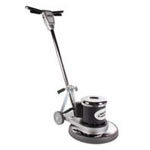 This is for preparation to scrub your floor for higher grit pads like the white, yellow, and green twister pads. This red pad should always be used with water and should be used at speeds only up to 350 rpms due to the abrasiveness of the pad. The Twister pads are made with small diamonds that clean and polish your floor at the same time. Prepping your floors with these pads require no chemicals and can be used with just water, making these pads environmentally friendly and will save you money. This is all done while producing excellent and lasting results. These pads can be used on a range of floors including marble, concrete, terrazzo, vinyl, rubber, and more. Using these pads will create a safer surface to walk on by increasing slip resistance as well as a resistance to dirt and wear. No extra equipment is required for your floor buffer, so you know you’ll be able to start your cleaning as soon as you get the pads. This red pad is part of our starter kit which holds one of each of the 4 different Twister diamond concrete prep pads. If you own a rectangular buffer, please take a look at our rectangular Twister red pads. For use on floor buffers up to 350 rpms.